These pillars are interrelated and mutually reinforcing. An effective nonproliferation regime whose members comply with their obligations provides an essential foundation for progress on disarmament and makes possible greater cooperation on the peaceful use of nuclear energy. With the right to access the benefits of peaceful nuclear technology comes the responsibility of nonproliferation. Progress on disarmament reinforces efforts to strengthen the nonproliferation regime and to enforce compliance with obligations, thereby also facilitating peaceful nuclear cooperation. The "pillars" concept has been questioned by some who believe that the NPT is, as its name suggests, principally about nonproliferation, and who worry that "three pillars" language misleadingly implies that the three elements have equivalent importance. Under Article I of the NPT, nuclear-weapon states pledge not to transfer nuclear weapons or other nuclear explosive devices to any recipient or in any way assist, encourage or induce any non-nuclear-weapon state in the manufacture or acquisition of a nuclear weapon. Under Article II of the NPT, non-nuclear-weapon states pledge not to acquire or exercise control over nuclear weapons or other nuclear explosive devices and not to seek or receive assistance in the manufacture of such devices. Under Article III of the Treaty, non-nuclear-weapon states pledge to accept IAEA safeguards to verify that their nuclear activities serve only peaceful purposes. 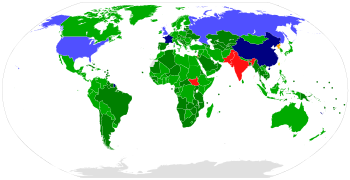 Five states are recognized by NPT as nuclear weapon states (NWS): China (signed 1992), France (1992), the Soviet Union (1968; obligations and rights now assumed by the Russian Federation), the United Kingdom (1968), and the United States (1968). These five nations are also the five permanent members of the United Nations Security Council. These five NWS agree not to transfer "nuclear weapons or other nuclear explosive devices" and "not in any way to assist, encourage, or induce" a non-nuclear weapon state (NNWS) to acquire nuclear weapons (Article I). NNWS parties to the NPT agree not to "receive", "manufacture", or "acquire" nuclear weapons or to "seek or receive any assistance in the manufacture of nuclear weapons" (Article II). NNWS parties also agree to accept safeguards by the International Atomic Energy Agency (IAEA) to verify that they are not diverting nuclear energy from peaceful uses to nuclear weapons or other nuclear explosive devices (Article III). Under Article VI of the NPT, all Parties undertake to pursue good-faith negotiations on effective measures relating to cessation of the nuclear arms race, to nuclear disarmament, and to general and complete disarmament. NPT Article IV acknowledges the right of all Parties to develop nuclear energy for peaceful purposes and to benefit from international cooperation in this area, in conformity with their nonproliferation obligations. Article IV also encourages such cooperation. Article IX: "For the purposes of this Treaty, a nuclear-weapon State is one which has manufactured and exploded a nuclear weapon or other nuclear explosive device prior to 1 January 1967." Article X: Establishes the right to withdraw from the Treaty giving 3 months' notice. It also establishes the duration of the Treaty (25 years before 1995 Extension Initiative). The impetus behind the NPT was concern for the safety of a world with many nuclear weapon states. It was recognized that the cold war deterrent relationship between just the United States and Soviet Union was fragile. Having more nuclear-weapon states would reduce security for all, multiplying the risks of miscalculation, accidents, unauthorized use of weapons, or from escalation in tensions, nuclear conflict. Moreover, the use of nuclear weapons in Hiroshima and Nagasaki in 1945, it has been apparent that the development of nuclear capabilities by States could enable them to divert technology and materials for weapons purposes. Thus, the problem of preventing such diversions became a central issue in discussions on peaceful uses of nuclear energy. Initial efforts, which began in 1946, to create an international system enabling all States to have access to nuclear technology under appropriate safeguards, were terminated in 1949 without the achievement of this objective, due to serious political differences between the major Powers. By then, both the United States and the former Soviet Union had tested nuclear weapons, and were beginning to build their stockpiles. In December 1953, US President Dwight D. Eisenhower in his "Atoms for Peace" proposal, presented to the eighth session of the United Nations General Assembly, urged that an international organization be established to disseminate peaceful nuclear technology, while guarding against development of weapons capabilities in additional countries. His proposal resulted in 1957 in the establishment of the International Atomic Energy Agency (IAEA), which was charged with the dual responsibility of promotion and control of nuclear technology. IAEA technical activities began in 1958. An interim safeguards system for small nuclear reactors, put in place in 1961, was replaced in 1964 by a system covering larger installations and, over the following years, was expanded to include additional nuclear facilities. In recent years, efforts to strengthen the effectiveness and improve the efficiency of the IAEA safeguards system culminated in the approval of the Model Additional Protocol by the IAEA Board of Governors in May 1997. 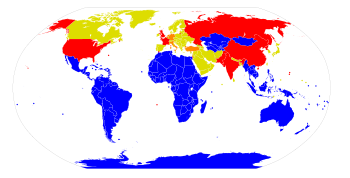 Within the framework of the United Nations, the principle of nuclear non-proliferation was addressed in negotiations as early as 1957. The NPT process was launched by Frank Aiken, Irish Minister for External Affairs, in 1958. The NPT gained significant momentum in the early 1960s. The structure of a treaty to uphold nuclear non-proliferation as a norm of international behaviour had become clear by the mid-1960s, and by 1968 final agreement had been reached on a Treaty that would prevent the proliferation of nuclear weapons, enable cooperation for the peaceful use of nuclear energy, and further the goal of achieving nuclear disarmament. It was opened for signature in 1968, with Finland the first State to sign. Accession became nearly universal after the end of the Cold War and of South African apartheid. In 1992, China and France acceded to the NPT, the last of the five nuclear powers recognized by the treaty to do so. The treaty provided, in article X, for a conference to be convened 25 years after its entry into force to decide whether the treaty should continue in force indefinitely, or be extended for an additional fixed period or periods. Accordingly, at the NPT Review and Extension Conference in May 1995, state parties to the treaty agreed-without a vote-on the treaty's indefinite extension, and decided that review conferences should continue to be held every five years. After Brazil acceded to the NPT in 1998, the only remaining non-nuclear-weapon state which had not signed was Cuba, which joined the NPT (and the Treaty of Tlatelolco NWFZ) in 2002. Several NPT states parties have given up nuclear weapons or nuclear weapons programs. South Africa undertook a nuclear weapons program, but has since renounced it and acceded to the treaty in 1991 after destroying its small nuclear arsenal; after this, the remaining African countries signed the treaty. The former Soviet Republics where nuclear weapons had been based, namely Ukraine, Belarus and Kazakhstan, transferred those weapons to Russia and joined the NPT by 1994 following the signature of the Budapest Memorandum on Security Assurances. Successor states from the breakups of Yugoslavia and Czechoslovakia also joined the treaty soon after their independence. Montenegro and East Timor were the last countries to accede to the treaty on their independence in 2006 and 2003; the only other country to accede in the 21st century was Cuba in 2002. The three Micronesian countries in Compact of Free Association with the USA joined the NPT in 1995, along with Vanuatu. Major South American countries Argentina, Chile, and Brazil joined in 1995 and 1998. Arabian Peninsula countries included Saudi Arabia and Bahrain in 1988, Qatar and Kuwait in 1989, UAE in 1995, and Oman in 1997. The tiny European states of Monaco and Andorra joined in 1995-6. Also acceding in the 1990s were Myanmar in 1992 and Guyana in 1993. Four states—India, Israel, Pakistan, and South Sudan—have never signed the treaty. India and Pakistan have publicly disclosed their nuclear weapon programs, and Israel has a long-standing policy of deliberate ambiguity with regards to its nuclear program (see List of states with nuclear weapons). India has detonated nuclear devices, first in 1974 and again in 1998. India is estimated to have enough fissile material for more than 150 warheads. India was among the few countries to have a no first use policy, a pledge not to use nuclear weapons unless first attacked by an adversary using nuclear weapons, however India's former NSA Shivshankar Menon signaled a significant shift from "no first use" to "no first use against non-nuclear weapon states" in a speech on the occasion of Golden Jubilee celebrations of the National Defence College in New Delhi on 21 October 2010, a doctrine Menon said reflected India's "strategic culture, with its emphasis on minimal deterrence". India argues that the NPT creates a club of "nuclear haves" and a larger group of "nuclear have-nots" by restricting the legal possession of nuclear weapons to those states that tested them before 1967, but the treaty never explains on what ethical grounds such a distinction is valid. India's then External Affairs Minister Pranab Mukherjee said during a visit to Tokyo in 2007: "If India did not sign the NPT, it is not because of its lack of commitment for non-proliferation, but because we consider NPT as a flawed treaty and it did not recognize the need for universal, non-discriminatory verification and treatment." Although there have been unofficial discussions on creating a South Asian nuclear weapons free zone, including India and Pakistan, this is considered to be highly unlikely for the foreseeable future. As of January 2011[update], Australia, a top three producer and home to world's largest known reserves, had continued its refusal to export Uranium to India despite diplomatic pressure from India. In November 2011 the Australian Prime Minister announced a desire to allow exports to India, a policy change which was authorized by her party's national conference in December. On 4 December 2011, Prime Minister Julia Gillard overturned Australia's long-standing ban on exporting uranium to India. She further said "We should take a decision in the national interest, a decision about strengthening our strategic partnership with India in this the Asian century," and said that any agreement to sell uranium to India would include strict safeguards to ensure it would only be used for civilian purposes, and not end up in nuclear weapons. On Sep 5, 2014; Australian Prime Minister Tony Abbott sealed a civil nuclear deal to sell uranium to India. "We signed a nuclear cooperation agreement because Australia trusts India to do the right thing in this area, as it has been doing in other areas," Abbott told reporters after he and Indian Prime Minister Narendra Modi signed a pact to sell uranium for peaceful power generation. In May 1998, following India's nuclear tests earlier that month, Pakistan conducted two sets of nuclear tests, the Chagai-I and Chagai-II. Although there is little confirmed information in public, as of 2015, Pakistan was estimated to have as many as 120 warheads. According to analyses of the Carnegie Endowment for International Peace and the Stimson Center, Pakistan has enough fissile material for 350 warheads. Pakistani officials argue that the NPT is discriminatory. When asked at a briefing in 2015 whether Islamabad would sign the NPT if Washington requested it, Foreign Secretary Aizaz Ahmad Chaudhry was quoted as responding "It is a discriminatory treaty. Pakistan has the right to defend itself, so Pakistan will not sign the NPT. Why should we?" Until 2010, Pakistan had always maintained the position that it would sign the NPT if India did so. In 2010, Pakistan abandoned this historic position and stated that it would join the NPT only as a recognized nuclear-weapon state. The NSG Guidelines currently rule out nuclear exports by all major suppliers to Pakistan, with very narrow exceptions, since it does not have full-scope IAEA safeguards (i.e. safeguards on all its nuclear activities). Pakistan has sought to reach an agreement similar to that with India, but these efforts have been rebuffed by the United States and other NSG members, on the grounds that Pakistan's track record as a nuclear proliferator makes it impossible for it to have any sort of nuclear deal in the near future. By 2010, China reportedly signed a civil nuclear agreement with Pakistan, using the justification that the deal was "peaceful." The British government criticized this, on the grounds that 'the time is not yet right for a civil nuclear deal with Pakistan'. China did not seek formal approval from the nuclear suppliers group, and claimed instead that its cooperation with Pakistan was "grandfathered" when China joined the NSG, a claim that was disputed by other NSG members. Pakistan applied for membership on 19 May 2016, supported by Turkey and China However, many NSG members opposed Pakistan's membership bid due to its track record, including the illicit procurement network of Pakistani scientist A.Q. Khan, which aided the nuclear programs of Iran, Libya and North Korea. Pakistani officials reiterated the request in August 2016. Israel has a long-standing policy of deliberate ambiguity with regards to its nuclear program (see List of countries with nuclear weapons). Israel has been developing nuclear technology at its Dimona site in the Negev since 1958, and some nonproliferation analysts estimate that Israel may have stockpiled between 100 and 200 warheads using reprocessed plutonium. The position on the NPT is explained in terms of "Israeli exceptionality", a term coined by Professor Gerald M. Steinberg, in reference to the perception that the country's small size, overall vulnerability, as well as the history of deep hostility and large-scale attacks by neighboring states, require a deterrent capability. The Israeli government refuses to confirm or deny possession of nuclear weapons, although this is now regarded as an open secret after Israeli low-level nuclear technician Mordechai Vanunu—subsequently arrested and sentenced for treason by Israel—published evidence about the program to the British Sunday Times in 1986. On 18 September 2009 the General Conference of the International Atomic Energy Agency called on Israel to open its nuclear facilities to IAEA inspection and adhere to the non-proliferation treaty as part of a resolution on "Israeli nuclear capabilities," which passed by a narrow margin of 49–45 with 16 abstentions. The chief Israeli delegate stated that "Israel will not co-operate in any matter with this resolution." However, similar resolutions were defeated in 2010, 2013, 2014, and 2015. As with Pakistan, the NSG Guidelines currently rule out nuclear exports by all major suppliers to Israel. North Korea acceded to the treaty on 12 December 1985, but gave notice of withdrawal from the treaty on 10 January 2003 following U.S. allegations that it had started an illegal enriched uranium weapons program, and the U.S. subsequently stopping fuel oil shipments under the Agreed Framework which had resolved plutonium weapons issues in 1994. The withdrawal became effective 10 April 2003 making North Korea the first state ever to withdraw from the treaty. North Korea had once before announced withdrawal, on 12 March 1993, but suspended that notice before it came into effect. In 2007, reports from Washington suggested that the 2002 CIA reports stating that North Korea was developing an enriched uranium weapons program, which led to North Korea leaving the NPT, had overstated or misread the intelligence. On the other hand, even apart from these press allegations, there remains some information in the public record indicating the existence of a uranium effort. Quite apart from the fact that North Korean First Vice Minister Kang Sok Ju at one point admitted the existence of a uranium enrichment program, Pakistan's then-President Musharraf revealed that the A.Q. Khan proliferation network had provided North Korea with a number of gas centrifuges designed for uranium enrichment. Additionally, press reports have cited U.S. officials to the effect that evidence obtained in dismantling Libya's WMD programs points toward North Korea as the source for Libya's uranium hexafluoride (UF6) – which, if true, would mean that North Korea has a uranium conversion facility for producing feedstock for centrifuge enrichment. Iran is a party to the NPT since 1970 but was found in non-compliance with its NPT safeguards agreement, and the status of its nuclear program remains in dispute. In November 2003 IAEA Director General Mohamed ElBaradei reported that Iran had repeatedly and over an extended period failed to meet its safeguards obligations, including by failing to declare its uranium enrichment program. After about two years of EU3-led diplomatic efforts and Iran temporarily suspending its enrichment program, the IAEA Board of Governors, acting under Article XII.C of the IAEA Statute, found in a rare non-consensus decision with 12 abstentions that these failures constituted non-compliance with the IAEA safeguards agreement. This was reported to the UN Security Council in 2006, after which the Security Council passed a resolution demanding that Iran suspend its enrichment. Instead, Iran resumed its enrichment program. The IAEA has been able to verify the non-diversion of declared nuclear material in Iran, and is continuing its work on verifying the absence of undeclared activities. In February 2008, the IAEA also reported that it was working to address "alleged studies" of weaponization, based on documents provided by certain Member States, which those states claimed originated from Iran. Iran rejected the allegations as "baseless" and the documents as "fabrications." In June 2009, the IAEA reported that Iran had not "cooperated with the Agency in connection with the remaining issues ... which need to be clarified to exclude the possibility of military dimensions to Iran's nuclear program." Libya had signed (in 1968) and ratified (in 1975) the Nuclear Non-Proliferation Treaty and was subject to IAEA nuclear safeguards inspections, but undertook a secret nuclear weapons development program in violation of its NPT obligations, using material and technology provided by the A.Q. Khan proliferation network—including actual nuclear weapons designs allegedly originating in China. Libya began secret negotiations with the United States and the United Kingdom in March 2003 over potentially eliminating its WMD programs. In October 2003, Libya was embarrassed by the interdiction of a shipment of Pakistani-designed centrifuge parts sent from Malaysia, also as part of A. Q. Khan's proliferation ring. Syria is a state party to the NPT since 1969 and has a limited civil nuclear program. Before the advent of the Syrian Civil War it was known to operate only one small Chinese-built research reactor, SRR-1. Despite being a proponent of a Weapons of Mass Destruction Free Zone in the Middle East the country was accused of pursuing a military nuclear program with a reported nuclear facility in a desert Syrian region of Deir ez-Zor. The reactor's components had likely been designed and manufactured in North Korea, with the reactor's striking similarity in shape and size to the North Korean Yongbyon Nuclear Scientific Research Center. That information alarmed Israeli military and intelligence to such a degree that the idea of a targeted airstrike was conceived. It resulted in Operation Orchard, that took place on 6 September 2007 and saw as many as eight Israeli aircraft taking part. Israeli government is said to have bounced the idea of the operation off the US Bush administration, although the latter disagreed to participate. The nuclear reactor was destroyed in the attack, which also killed about ten North Korean workers. The attack didn't cause an international outcry or any serious Syrian retaliatory moves as both parties tried to keep it secret: Despite a half-century state of war declared by surrounding states Israel didn't want publicity as regards its breach of the ceasefire while Syria wasn't willing to acknowledge its clandestine nuclear program. NATO states argue that when there is a state of "general war" the treaty no longer applies, effectively allowing the states involved to leave the treaty with no notice. This is a necessary argument to support the NATO nuclear weapons sharing policy, but a troubling one for the logic of the treaty. NATO's argument is based on the phrase "the consequent need to make every effort to avert the danger of such a war" in the treaty preamble, inserted at the behest of U.S. diplomats, arguing that the treaty would at that point have failed to fulfill its function of prohibiting a general war and thus no longer be binding. Many states do not accept this argument.[who?] See United States–NATO nuclear weapons sharing above. On 18 July 2005, US President George W. Bush met Indian Prime Minister Manmohan Singh and declared that he would work to change US law and international rules to permit trade in US civilian nuclear technology with India. At the time, British columnist George Monbiot argued that the U.S.-India nuclear deal, in combination with US attempts to deny Iran (an NPT signatory) civilian nuclear fuel-making technology, might destroy the NPT regime. The 2015 Review Conference of the Parties to the Treaty on the Non-Proliferation of Nuclear Weapons (NPT) was held at the United Nations in New York from 27 April to 22 May 2015 and presided over by Ambassador Taous Feroukhi of Algeria. The Treaty, particularly article VIII, paragraph 3, envisages a review of the operation of the Treaty every five years, a provision which was reaffirmed by the States parties at the 1995 NPT Review and Extension Conference and the 2000 NPT Review Conference. At the 2015 NPT Review Conference, States parties examined the implementation of the Treaty's provisions since 2010. Despite intensive consultations, the Conference was not able to reach agreement on the substantive part of the draft Final Document. Over the years the NPT has come to be seen by many Third World states as "a conspiracy of the nuclear 'haves' to keep the nuclear 'have-nots' in their place". This argument has roots in Article VI of the treaty which "obligates the nuclear weapons states to liquidate their nuclear stockpiles and pursue complete disarmament. The non-nuclear states see no signs of this happening". Some argue that the NWS have not fully complied with their disarmament obligations under Article VI of the NPT. Some countries such as India have criticized the NPT, because it "discriminated against states not possessing nuclear weapons on January 1, 1967," while Iran and numerous Arab states have criticized Israel for not signing the NPT. There has been disappointment with the limited progress on nuclear disarmament, where the five authorized nuclear weapons states still have 22,000 warheads among them and have shown a reluctance to disarm further. As noted above, the International Court of Justice, in its advisory opinion on the Legality of the Threat or Use of Nuclear Weapons, stated that "there exists an obligation to pursue in good faith and bring to a conclusion negotiations leading to nuclear disarmament in all its aspects under strict and effective international control. Some critics of the nuclear-weapons states contend that they have failed to comply with Article VI by failing to make disarmament the driving force in national planning and policy with respect to nuclear weapons, even while they ask other states to plan for their security without nuclear weapons. Based on concerns over the slow pace of nuclear disarmament and the continued reliance on nuclear weapons in military and security concepts, doctrines and policies, the Treaty on the Prohibition of Nuclear Weapons was adopted in July 2017 and was subsequently opened for signature on 20 September 2017. Upon entry into force, it will prohibit each state party from the development, testing, production, stockpiling, stationing, transfer, use and threat of use of nuclear weapons, as well as assistance to those activities. It reaffirms in its preamble the vital role of the full and effective implementation of the NPT. ^ "Treaty on the Non-Proliferation of Nuclear Weapons". United Nations Office for Disarmament Affairs. Retrieved 13 May 2017. ^ a b "UNODA - Non-Proliferation of Nuclear Weapons (NPT)". un.org. Retrieved 20 February 2016. ^ "Decisions Adopted at the 1995 NPT Review & Extension Conference - Acronym Institute". ^ "Nuclear Non-Proliferation Treaty (NPT)" (PDF). Defense Treaty Inspection Readiness Program - United States Department of Defense. Defense Treaty Inspection Readiness Program. Archived from the original (PDF) on 11 March 2013. Retrieved 19 June 2013. ^ a b c Graham, Jr., Thomas (November 2004). "Avoiding the Tipping Point". Arms Control Association. ^ a b c d e Benjamin K. Sovacool (2011). Contesting the Future of Nuclear Power: A Critical Global Assessment of Atomic Energy, World Scientific, pp. 187–190. ^ a b c Thomas C. Reed and Danny B. Stillman (2009). The Nuclear Express: A Political History of the Bomb and its Proliferation, Zenith Press, p. 144. ^ See, for example, the Canadian government's NPT web site The Nuclear Non-Proliferation Treaty. ^ This view was expressed by Christopher Ford, the U.S. NPT representative at the end of the Bush Administration. See "The 2010 Review Cycle So Far: A View from the United States of America," presented at Wilton Park, United Kingdom, 20 December 2007. ^ "Information Circulars" (PDF). iaea.org. Archived from the original (PDF) on 7 August 2007. ^ "U.S. Compliance With Article VI of the NPT". Acronym.org.uk. Retrieved 25 November 2010. ^ a b The ICJ (8 July 1996). "Legality of the threat or use of nuclear weapons". Retrieved 6 July 2011. ^ Mishra, J. "NPT and the Developing Countries", (Concept Publishing Company, 2008). ^ U.S. Special Representative for Nuclear Nonproliferation Christopher Ford, "Disarmament and Non-Nuclear Stability in Tomorrow's World," remarks to the Conference on Disarmament and Nonproliferation Issues, Nagasaki, Japan (31 August 2007). ^ Zaki, Mohammed M. (24 May 2011). American Global Challenges: The Obama Era. Palgrave Macmillan. ISBN 9780230119116. ^ "Treaty on the Non-Proliferation of Nuclear Weapons" (PDF). Retrieved 8 October 2015. ^ Daniel Dombey (19 February 2007). "Director General's Interview on Iran and DPRK". Financial Times. Archived from the original on 22 February 2007. Retrieved 4 May 2006. ^ See Remarks by President Bush at the National Defense University (11 February 2004), available at https://georgewbush-whitehouse.archives.gov/news/releases/2004/02/20040211-4.html (announcing initiative to stop spread of ENR technology). ^ "IAEA predicts more nuclear states". BBC. 16 October 2006. Retrieved 12 March 2016. ^ a b "Implementation of the NPT Safeguards Agreement in the Islamic Republic of Iran" (PDF). IAEA. 10 November 2003. GOV/2003/75. Archived from the original (PDF) on 25 October 2007. Retrieved 25 October 2007. ^ a b "Implementation of the NPT Safeguards Agreement in the Islamic Republic of Iran" (PDF). IAEA. 24 September 2005. GOV/2005/77. Archived from the original (PDF) on 25 October 2007. Retrieved 25 October 2007. ^ Mohamed ElBaradei (2004). "Preserving the Non-Proliferation Treaty" (PDF). Disarmament Forum. Archived from the original (PDF) on 27 November 2007. Retrieved 17 November 2007. ^ "Nuclear Non-Proliferation Treaty (PDF) – IAEA" (PDF). Archived from the original (PDF) on 2 December 2010. Retrieved 25 November 2010. ^ a b Otfried Nassauer, Institute for Energy and Environmental Research (ieer.org), Science for Democratic Action Volume 9 Number 3, May 2001, Nuclear Sharing in NATO: Is it Legal? ^ See, e.g., U.S. Director of Central Intelligence, Likelihood and Consequences of a Proliferation of Nuclear Weapons Systems, declassified U.S. National Intelligence Estimate, NIE 4–63 (28 June 1963), at p.17, paragraph 40. ^ See, e.g., U.S. Director of Central Intelligence, Annex to National Intelligence Estimate No. 100-2-58: Development of Nuclear Capabilities by Fourth Countries: Likelihood and Consequences, declassified U.S. National Intelligence Estimate, NIE 100-2-58 (1 July 1958), at p.4, paragraphs 18–19; U.S. Director of Central Intelligence, Likelihood and Consequences of the Development of Nuclear Capabilities by Additional Countries, declassified U.S. National Intelligence Estimate, NIE 100-4-60 (20 September 1960), at p. 2, paragraph 4, & p.8, paragraphs 27–29. ^ "A-bomb victims warn of nuclear horror". BBC News. ^ a b Tellis, Ashley J. "Atoms for War?" (PDF). Carnegie Endowment for International Peace. Retrieved 24 October 2015. ^ "NSA Shivshankar Menon at NDC (Speech)". india Blooms. Archived from the original on 27 January 2013. Retrieved 30 April 2013. ^ "Draft Report of National Security Advisory Board on Indian Nuclear Doctrine". Embassy of India Washington D.C. Archived from the original on 5 December 2009. Retrieved 30 April 2013. ^ "India seeks Japan's support, calls NPT 'flawed'". Whereincity.com. 24 March 2007. Archived from the original on 12 January 2012. Retrieved 25 November 2010. ^ Banerjee, Dipankar (1998). Thakur, Ramesh (ed.). The Obstacles to a South Asian Nuclear-Weapons-Free-Zone. Nuclear Weapons-Free Zones. London: Macmillan. ISBN 978-0-333-73980-8. ^ "Remarks With International Atomic Energy Agency Director General Mohamed ElBaradei" (PDF). Archived from the original (PDF) on 26 March 2009. Retrieved 25 November 2010. ^ (AFP) – 1 October 2008 (1 October 2008). "AFP: India energised by nuclear pacts". Archived from the original on 20 May 2011. Retrieved 25 November 2010. ^ "IAEA Board Approves India-Safeguards Agreement". Iaea.org. Retrieved 25 November 2010. ^ "NSG CLEARS NUCLEAR WAIVER FOR INDIA". CNN-IBN. 6 September 2008. Retrieved 6 September 2008. ^ "INDIA JOINS NUCLEAR CLUB, GETS NSG WAIVER". NDTV.com. 6 September 2008. Archived from the original on 8 September 2008. Retrieved 6 September 2008. ^ "Yes for an Answer". The Washington Post. 12 September 2008. Retrieved 20 May 2010. ^ "President Bush Signs H.R. 7081, the United States-India Nuclear Cooperation Approval and Nonproliferation Enhancement Act". Georgewbush-whitehouse.archives.gov. 8 October 2008. Retrieved 25 November 2010. ^ a b c "White House Low-Key on China-Pakistan Nuke Deal". Global Issues. 30 June 2010. Retrieved 12 March 2012. ^ "Rudd resists India's push for uranium deal". ABC Online. 20 January 2011. Retrieved 20 January 2011. ^ "An opportunity for sound and fury signifying something". The Age. 15 November 2011. Retrieved 15 November 2011. ^ "PM changes mind on uranium sales to India". ABC Online. 15 November 2011. Retrieved 15 November 2011. ^ a b "Australia's Labor party backs uranium sales to India". BBC News. 4 December 2011. Retrieved 4 December 2011. ^ "India and Australia seal civil nuclear deal for uranium trade". Reuters India. ^ Anwar Iqbal. "Impact of US wargames on Pakistan N-arms 'negative'". dawn.com. Archived from the original on 27 September 2013. ^ Craig, Tim (27 August 2015). "Report: Pakistan's nuclear arsenal could become the world's third-biggest". The Washington Post. Retrieved 24 October 2015. ^ Anwar Iqbal. "Pakistan will not sign NPT, says foreign secretary". ^ "Pakistan against signing the NPT as a non-nuclear weapons state". ^ a b "BBC News – China says Pakistan nuclear deal 'peaceful'". BBC News. 17 June 2010. Retrieved 12 March 2012. ^ a b "The China-Pakistan Nuclear Deal: A Realpolitique Fait Accompli". NTI. Retrieved 12 March 2012. ^ "Kiwis soft on India's NSG bid, Turkey backs Pak - TOI Mobile | The Times of India Mobile Site". m.timesofindia.com. Retrieved 20 June 2016. ^ "China says more talks needed to build consensus on nuclear export club". 12 June 2016 – via Reuters. ^ Guardia, By Ahmed Rashid in Lahore and Anton La. "I've sold nuclear secrets to Libya, Iran and N Korea". ^ "Pakistan launches fresh push for NSG membership". 23 August 2016. Retrieved 24 August 2016. ^ Steinberg, Gerald (2006). "EXAMINING ISRAEL'S NPT EXCEPTIONALITY: 1998–2005". Ther NonProliferation Review. 13 (1): 117–141. doi:10.1080/10736700600861376. ^ Cohen, Avner (2010). The Worst Kept Secret. New York: Columbia University Press. p. 266. ^ "Israel pressured on nuclear sites – Middle East". Al Jazeera English. 18 September 2009. Retrieved 25 November 2010. ^ IAEA Members Reject Israel Resolution, Kelsey Davenport, Arms Control Today, October 2, 2013. ^ Resolution Calling Out Israel Fails, Kelsey Davenport, Arms Control Today, October 2015. ^ "Text of Agreed Framework" (PDF). Archived from the original (PDF) on 4 June 2011. Retrieved 25 November 2010. ^ Khan, Joseph (19 September 2005). "North Korea Says It Will Abandon Nuclear Efforts". New York Times. ^ (in English) Magnitude 4.3—North Korea 2006 October 09 01:35:28 UTC (Report). United States Geological Survey (USGS). 9 October 2006. Archived from the original on 27 April 2014. Retrieved 2 December 2010. ^ Carol Giacomo (10 February 2007). "N.Korean uranium enrichment program fades as issue". Reuters. Retrieved 11 February 2007. ^ Sanger, David E.; Broad, William J. (1 March 2007). "U.S. Had Doubts on North Korean Uranium Drive". New York Times. Retrieved 1 March 2007. ^ Kessler, Glenn (1 March 2007). "New Doubts on Nuclear Efforts by North Korea". Washington Post. Retrieved 1 March 2007. ^ "Another Intelligence Twist". Washington Post. 2 March 2007. Retrieved 10 March 2007. ^ See generally U.S. Department of State, "Adherence to and Compliance With Arms Control, Nonproliferation, and Disarmament Agreements and Commitments", August 2005, pp. 87–92, www.state.gov/documents/organization/52113.pdf; Anthony Faiola, "N. Korea Declares Itself a Nuclear Power," The Washington Post, 10 February 2005, www.washingtonpost.com/wp-dyn/articles/A12836-2005Feb10.html; "Khan 'Gave N. Korea Centrifuges'", BBC News, 24 August 2005, http://news.bbc.co.uk/2/hi/south_asia/4180286.stm; "Pakistan and North Korea: Dangerous Counter-Trades", IISS Strategic Comments, Vol. 8, No. 9 (November 2002). ^ AFP. "EU and Iran Avert Nuclear Deadlock". Dw-world.de. Retrieved 25 November 2010. ^ "''BBC'': Iran 'resumes' nuclear enrichment". BBC News. 13 February 2006. Retrieved 25 November 2010. ^ "Microsoft Word - gov2007-58.doc" (PDF). Archived from the original (PDF) on 2 December 2010. Retrieved 25 November 2010. ^ "Microsoft Word - gov2008-4.doc" (PDF). Archived from the original (PDF) on 2 December 2010. Retrieved 25 November 2010. ^ "Iran: Nuclear Intentions and Capabilities (National Intelligence Estimate)" (PDF). Archived from the original (PDF) on 22 November 2010. Retrieved 25 November 2010. ^ See, e.g., U.S. Special Representative for Nuclear Nonproliferation Christopher A. Ford, "The 2020 NPT Review Cycle So Far: A View from the United States of America," remarks at Wilton Park, UK (20 December 2007), http://www.state.gov/t/isn/rls/rm/98382.htm ("Given that possession of the necessary quantity of fissile material is the most difficult challenge in developing a nuclear weapon, the recently-released U.S. National Intelligence Estimate (NIE) hardly alleviates our concerns about Iran's nuclear work."). ^ Mark Mazzetti (6 February 2008). "Intelligence Chief Cites Qaeda Threat to U.S." New York Times. ^ "INFCIRC/724 – Communication dated 26 March 2008 received from the Permanent Mission of the Islamic Republic of Iran to the Agency" (PDF). Archived from the original (PDF) on 11 September 2010. Retrieved 25 November 2010. ^ "XV Ministerial Conference of the Non-Aligned Movement (July 2008): Statement on the Islamic Republic of Iran's Nuclear Issue" (PDF). Archived from the original (PDF) on 11 September 2010. Retrieved 25 November 2010. ^ "New START Treaty and Protocol". DipNote. 8 April 2010. Archived from the original on 19 October 2012. Retrieved 2 October 2012. ^ Implementation of the NPT Safeguards Agreement in the Socialist People's Libyan Arab Jamahiriya, International Atomic Energy Agency, GOV/2008/39, 12 September 2008. ^ Uncovering the Nuclear Black Market: Working Toward Closing Gaps in the International Nonproliferation Regime, by David Albright and Corey Hinderstein, Institute for Science and International Security, 4 June 2004. ^ See generally Assistant Secretary of State Paula DeSutter, "Libya Renounces Weapons of Mass Destruction, "Archived copy". Archived from the original on 12 November 2008. Retrieved 12 November 2008. CS1 maint: Archived copy as title (link); DeSutter, "Completion of Verification Work in Libya," testimony before the Subcommittee on International Terrorism, Nonproliferation, and Human Rights (22 September 2004), http://www.state.gov/t/vci/rls/rm/2004/37220.htm; DeSutter, "U.S. Government's Assistance to Libya in the Elimination of its Weapons of Mass Destruction (WMD)," testimony before the Senate Foreign Relations Committee (26 February 2004), http://www.state.gov/t/vci/rls/rm/2004/29945.htm. ^ "Libya: Nato to take command of no-fly zone". BBC News. Retrieved 20 February 2016. ^ Braut-Hegghammer, Malfrid. "Relinquished Nuclear Powers: A Case Study of Libya" in To Join or Not to Join the Nuclear Club: How Nations Think about Nuclear Weapons: Two Middle East Case Studies - Libya and Pakistan (Middle East Studies, April 2013). ^ "North Korea Profile – Nuclear Overview". Nti.org. Retrieved 25 November 2010. ^ "Media Advisory 2003/48 – IAEA Board of Governors Adopts Resolution on Safeguards in North Korea – 12 February". Iaea.org. Retrieved 25 November 2010. ^ "2000 NPT Review Conference". un.org. Retrieved 20 February 2016. ^ "US Report: China gifted nuclear bomb and Pakistan stole the technology". The world reporter. 18 November 2009. Retrieved 12 March 2012. ^ "Nuclear Weapons Proliferation report". Canadian Security Intelligence Service. October 2001. Archived from the original on 12 March 2012. Retrieved 12 March 2012. ^ "Heinrich Böll Stiftung European Union" (PDF). boell.eu. Archived from the original (PDF) on 23 August 2011. ^ Obama Calls for Global Nuclear Summit in March 2010 Archived 31 January 2010 at the Wayback Machine from America.gov, retrieved on 8 January 2010. ^ "Key Facts about the Nuclear Security Summit". Office of the Press Secretary. The White House. 13 April 2010. Archived from the original on 26 September 2012. Retrieved 23 August 2012. ^ "Communiqué of the Washington Nuclear Security Summit". Office of the Press Secretary. The White House. 13 April 2010. Archived from the original on 26 September 2012. Retrieved 23 August 2012. ^ "Work Plan of the Washington Nuclear Security Summit". Office of the Press Secretary. The White House. 13 April 2012. Retrieved 23 August 2012. ^ a b c Lubold, Gordon (19 June 2013). "Foreign Policy Situation Report: Obama to outline big nuke cuts today; DOD civilian owes $500k – to DOD; Petraeus to Team Rubicon; Hastings, dead; Say goodbye, Rambo; Tara Sonenshine on "bottom line diplomacy;" and a bit more". Foreign Policy. Retrieved 19 June 2013. ^ Newman, Scott (24 April 2014). "Pacific Island Nation Sues U.S., Others For Violating Nuclear Treaty". National Public Radio. Retrieved 24 April 2014. ^ "Insights Secure-2014: Questions On Current Events". Insights on India. Retrieved 24 October 2014. ^ Rendall, Steve. "Ignoring the U.S.'s "Bad Atoms"". Fair.org. Archived from the original on 24 November 2010. Retrieved 25 November 2010. ^ Fidler, David P. "India Wants to Join the Non-Proliferation Treaty as a Weapon State". Yale Global. Archived from the original on 24 October 2014. Retrieved 24 October 2014. ^ Reuters. "Pakistan and India refused to sign the Nuclear Non-Proliferation Treaty". The Nation. Retrieved 24 October 2014. ^ See. e.g., "Disarmament, the United States, and the NPT," http://www.state.gov/t/isn/rls/other/81946.htm; U.S. Special Representative for Nuclear Nonproliferation Christopher Ford, "Procedure and Substance in the NPT Review Cycle: The Example of Nuclear Disarmament," remarks to the Conference on "Preparing for 2010: Getting the Process Right," Annecy, France (17 March 2007), http://www.state.gov/t/isn/rls/rm/81940.htm; "The United States and Article VI: A Record of Accomplishment," "Archived copy" (PDF). Archived from the original (PDF) on 18 December 2008. Retrieved 12 November 2008. CS1 maint: Archived copy as title (link). ^ "The 2005 NPT Review Conference: A French Perspective". Armscontrol.org. Retrieved 25 November 2010. ^ "Statement by Russian Deputy Foreign Minister Kislyak at the 2005 NPT Review Conference" (PDF). Archived from the original (PDF) on 26 March 2009. Retrieved 25 November 2010. ^ "Statement of the P5 to the 2008 NPT PrepCom" (PDF). Archived from the original (PDF) on 4 June 2011. Retrieved 25 November 2010. George Perkovich [de], "Principles for Reforming the Nuclear Order", Proliferation Papers, Paris, Ifri, Fall 2008.